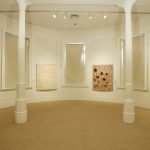 Mythology and Reality is a rare opportunity to view works from one of the most extensive collections of contemporary Aboriginal art held in private hands. 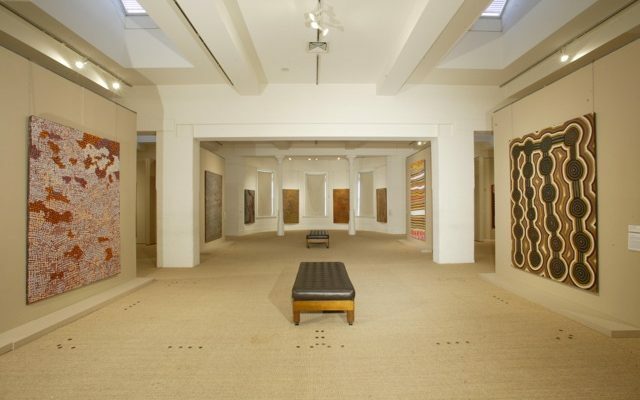 Over the past twenty-five years, respected Melbourne gallery owner, Gabrielle Pizzi, has assembled an extraordinary collection of contemporary Aboriginal art. Since her first acquisition in the late 1970s, Gabrielle’s focus has been her commitment to Aboriginal art and its promotion world wide. In her own words ‘this is her life’s abiding passion’. In this landmark exhibition 30 key artists from five Central Desert communities exemplify the richness and complexity of one of the most dynamic and significant movements in Australian art. These artists are from the communities of Papunya, Yuendumu, Utopia, Balgo Hills and Haasts Bluff, located north and west of Alice Springs in the Central Desert region of Australia. Papunya, located north-west of Alice Springs, is one of the largest artistic communities in this region and is the birthplace of one of the most significant movements in Australian art. In 1971 Geoffrey Bardon, an art teacher from Sydney, arrived at the small school of Papunya and with him came a freshness of vision and the genesis of the Papunya Tula movement. Bardon directed the children towards painting traditional Aboriginal patterns in the form of a mural on the unpainted walls below the classroom. This caught the attention of the local elders who offered to contribute and, after great deliberation, decided to transpose sacred ceremonial ground and body designs onto the walls of the school in the form of a mural. 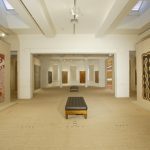 Yuendumu, located 300 kilometres north-west of Alice Springs, had a different beginning to Papunya and the artists were more aware of the emerging art market. In 1983 the principal of Yuendumu School, Terry Davis, encouraged senior men to paint the doors of the school with major Tjukurrpa or Dreamings of the area. This was also a way to pass on the Warlpiri law and culture to the children. Utopia lies 250 kilometres north east of Alice Springs and the Anmatyerre women in this area were influenced by an early experimentation with silk batik. In 1978 the Utopia Women’s Batik Association was formed with the women producing imagery based on ceremonial Awelye. Balgo Hills in the arid north-east of Western Australia, on the edge of the Great Sandy and Tanami Deserts, did not begin producing art for an outside audience until the late 1980s. Haasts Bluff is 230 kilometres west of Alice Springs and is one of the many places where communities have established centres to encourage artists and promote their work. 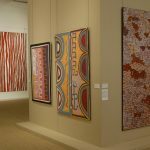 Works by leading Papunya artists Ronnie Tjampitjinpa, Turkey Tolson Tjupurrula, Michael Nelson Tjakamarra, Mick Namarari Tjapaltjarri, George Tjungurrayi, Fred Ward Tjunguarryi, Uta Uta Tjangala, Tatali Nangala and Walter Tjampitjinpa, and also by eminent artists from other desert communities including Alice Nampitjinpa from Haasts Bluff and Emily Kame Kngwarreye and Gloria Petyarre from Utopia, form part of this fascinating and expository exhibition.